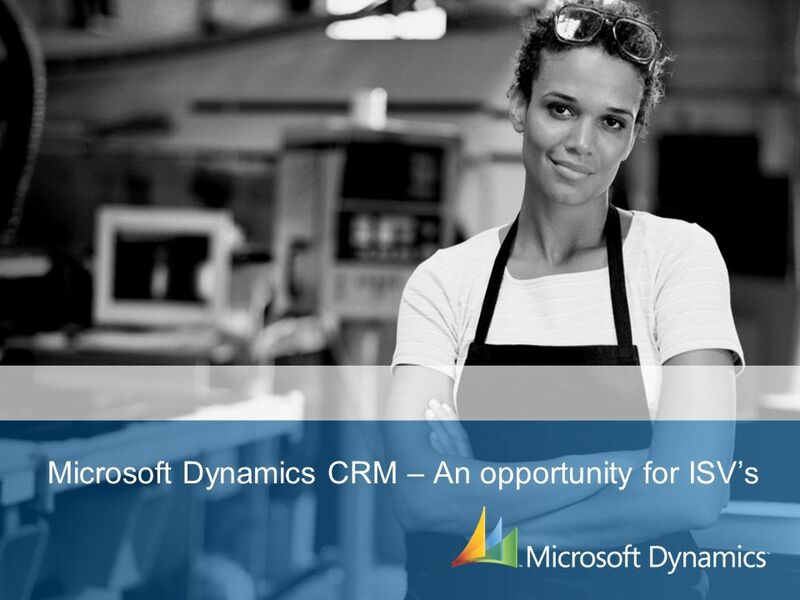 Microsoft Dynamics CRM – An opportunity for ISVs. 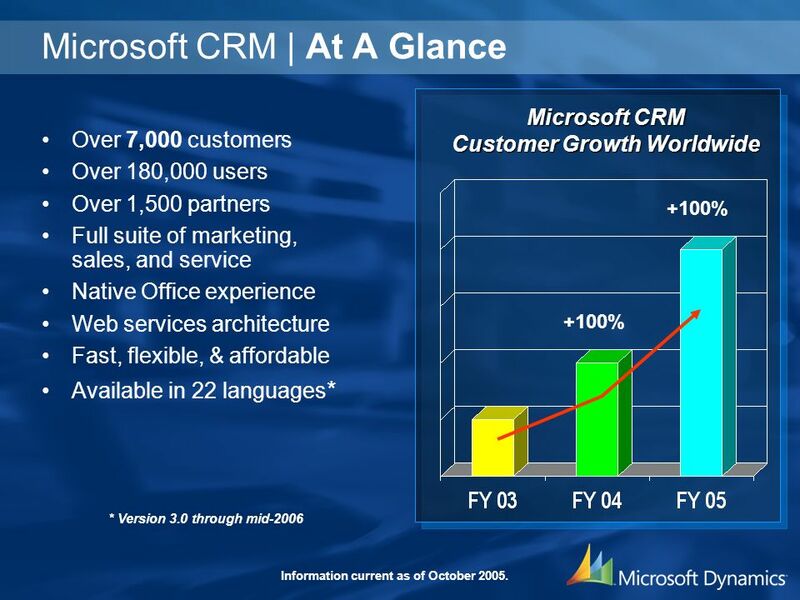 4 Microsoft CRM | At A Glance Over 7,000 customers Over 180,000 users Over 1,500 partners Full suite of marketing, sales, and service Native Office experience Web services architecture Fast, flexible, & affordable Available in 22 languages * Microsoft CRM Customer Growth Worldwide +100% * Version 3.0 through mid-2006 Information current as of October 2005. 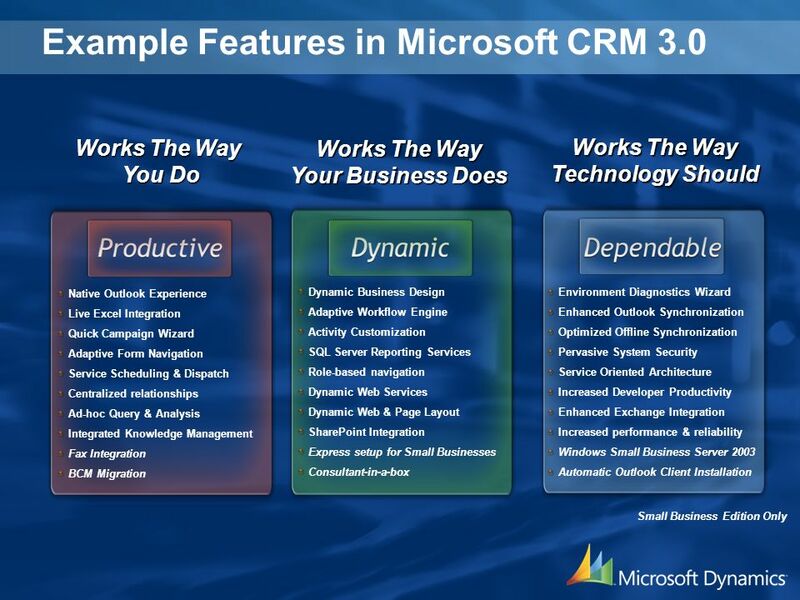 5 Works the Way Your Business Does Easily adapts to each companys needs Powerful workflow and analytics Works the Way Technology Should Fast to deploy & easy to manage Powerful Web services architecture Works the Way You Do Native Office & Outlook experience Full range of mobile solutions SalesService Marketing Microsoft CRM | The Next Wave A complete CRM suite that leverages the power and productivity of the Microsoft platform. 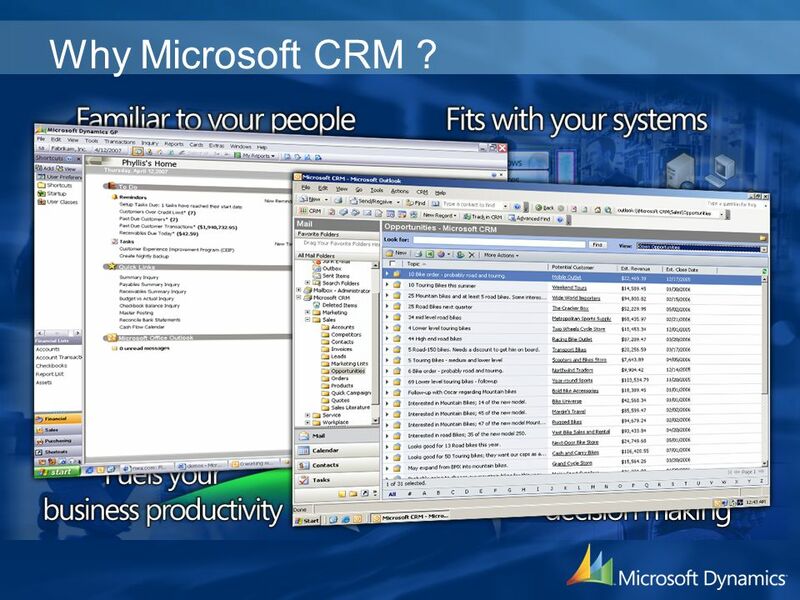 8 Why Microsoft CRM ? 16 Try it out in your business 90 day free trial license NFR licenses for partners Want to discuss further? 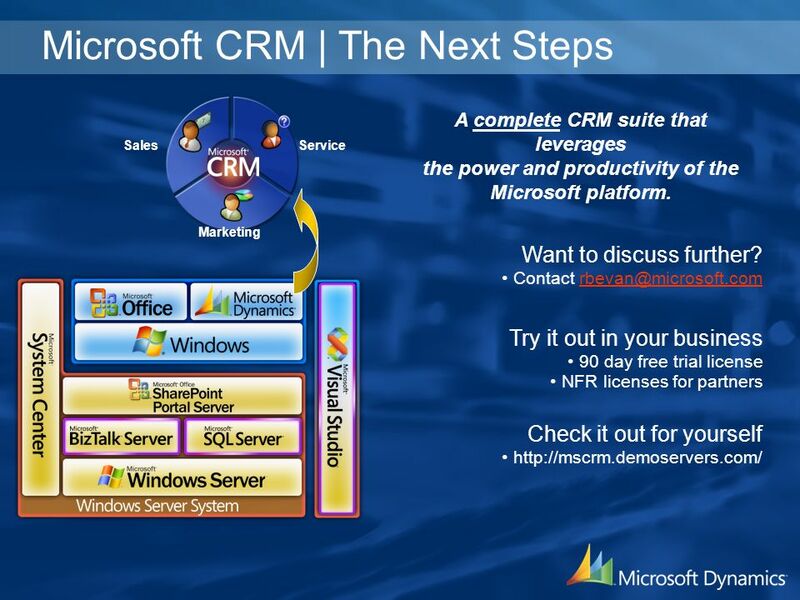 Contact rbevan@microsoft.comrbevan@microsoft.com Check it out for yourself http://mscrm.demoservers.com/ SalesService Marketing Microsoft CRM | The Next Steps A complete CRM suite that leverages the power and productivity of the Microsoft platform. 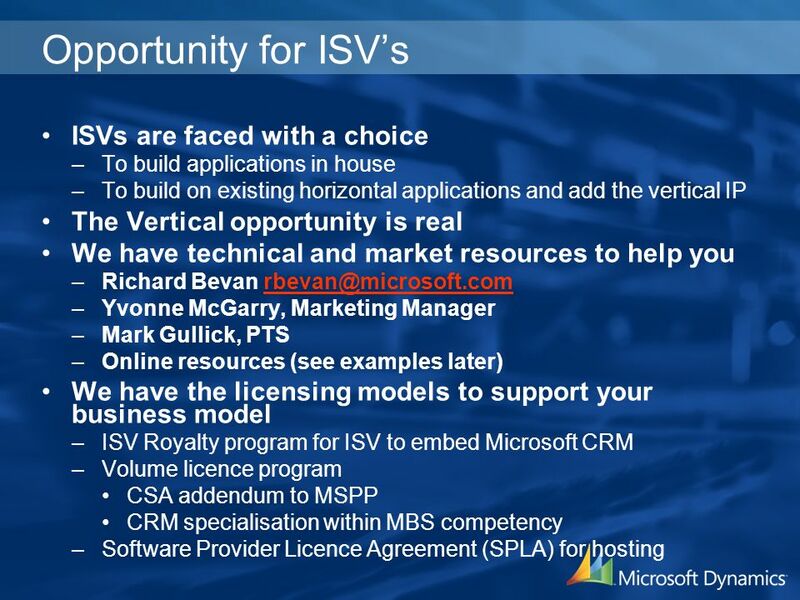 Download ppt "Microsoft Dynamics CRM – An opportunity for ISVs." 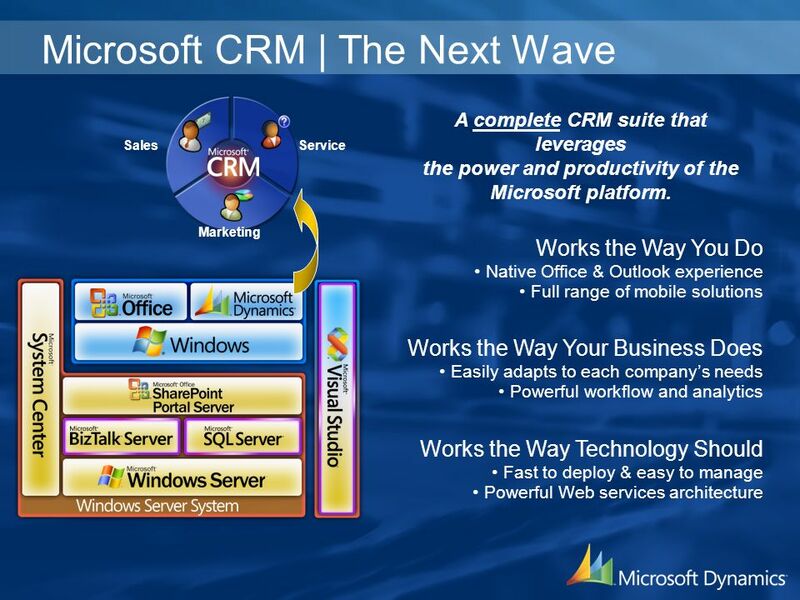 An hour with Dave and friends - Microsoft CRM David Overton Reuben Krippner. 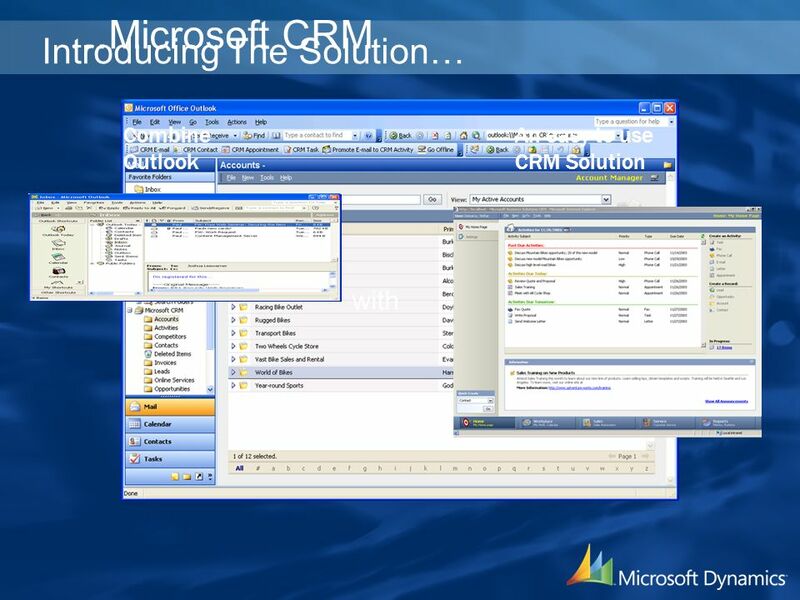 Maximizer CRM Chris Dauth RapidCRM. 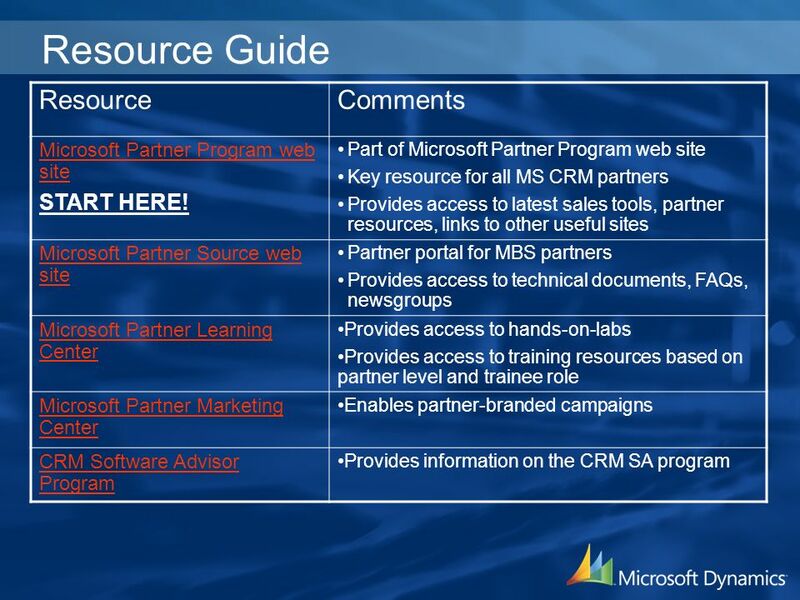 Extending Your Reach with SharePoint and Office. 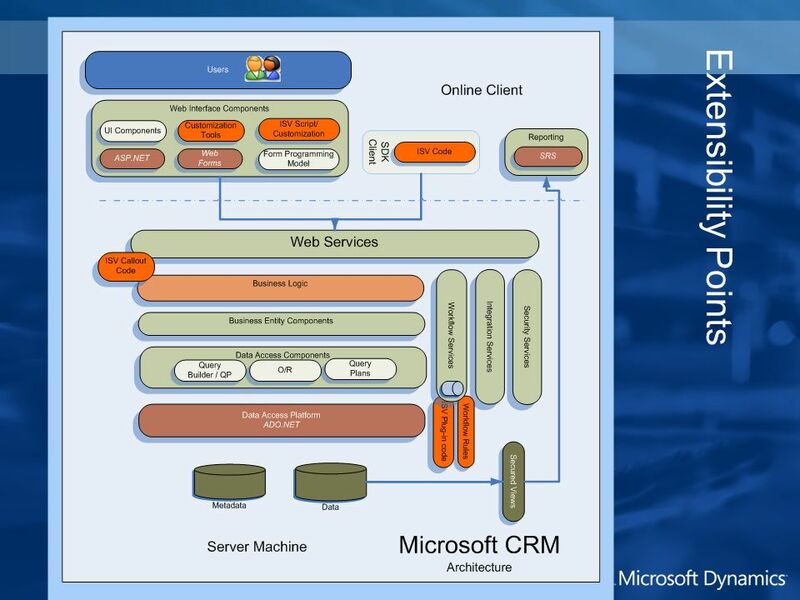 Ignite: Office SharePoint Azure. 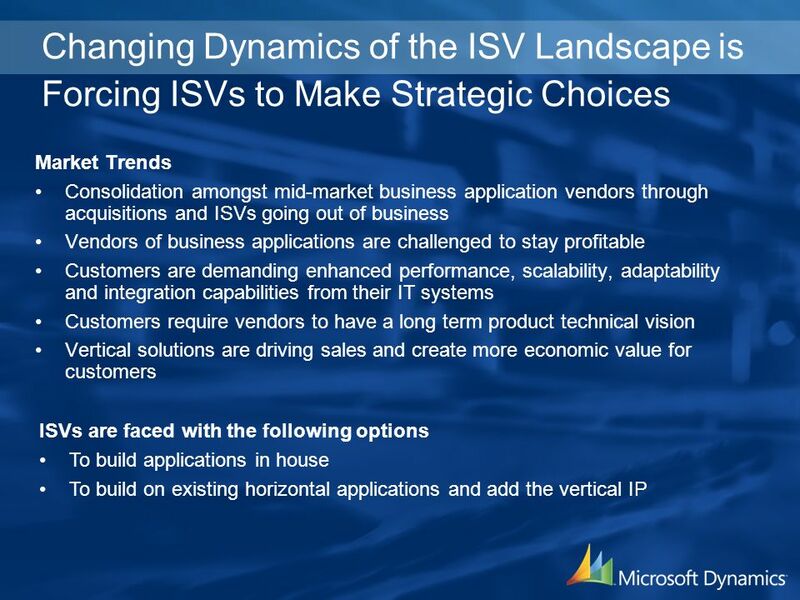 Purpose: These slides are for use with customers by the Microsoft Dynamics NAV sales force and partners. 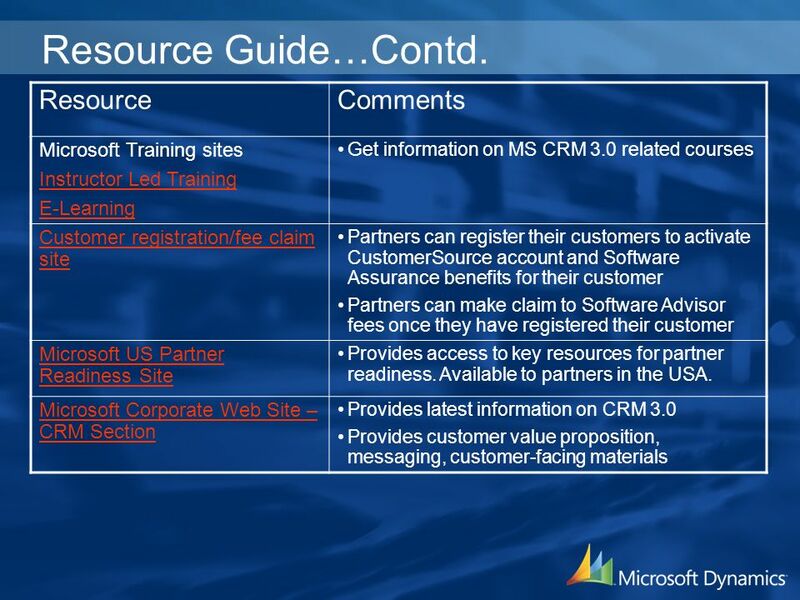 How to use: Add these slides to the core customer. ACT! 3.0 For Notes R5 Turning Contacts Into Relationships and Relationships Into Results Copyright (C) 2002 – GL Computing. 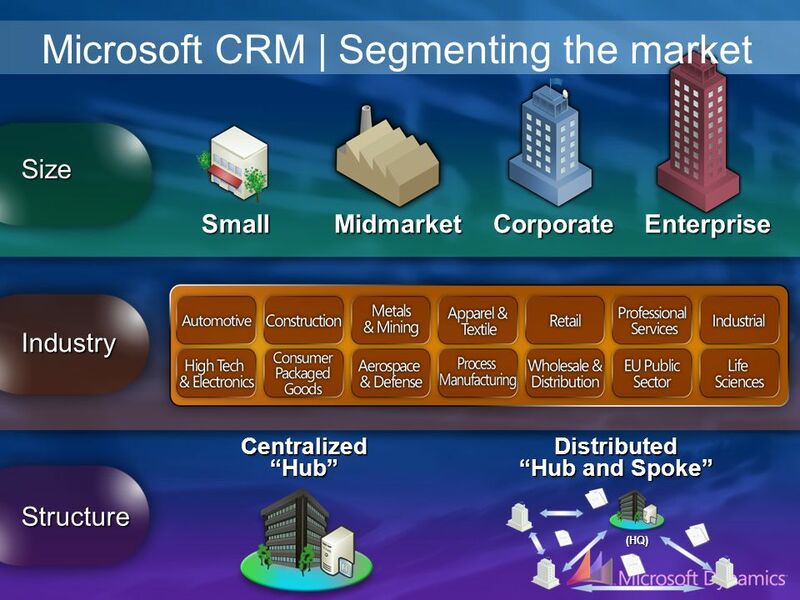 Break Out from a Marketing Slump with Microsoft Dynamics CRM. Office 2010: Customer Sales Presentation Part 2 Andy McNulty | Partner Territory Manager | Midwest Area. 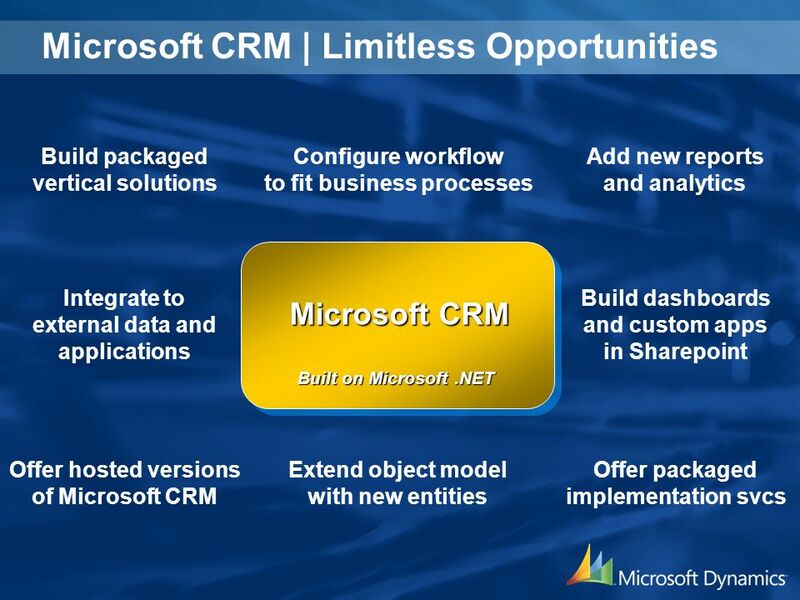 Melanie Gass CenterPoint Solution CRM SOLUTIONS Microsoft Dynamics CRM | At A Glance Over 10,000 customersOver 10,000 customers Over 500,000 usersOver. XProtect ® Express Integration made easy. With support for up to 48 cameras, XProtect Express is easy and affordable IP video surveillance software with. 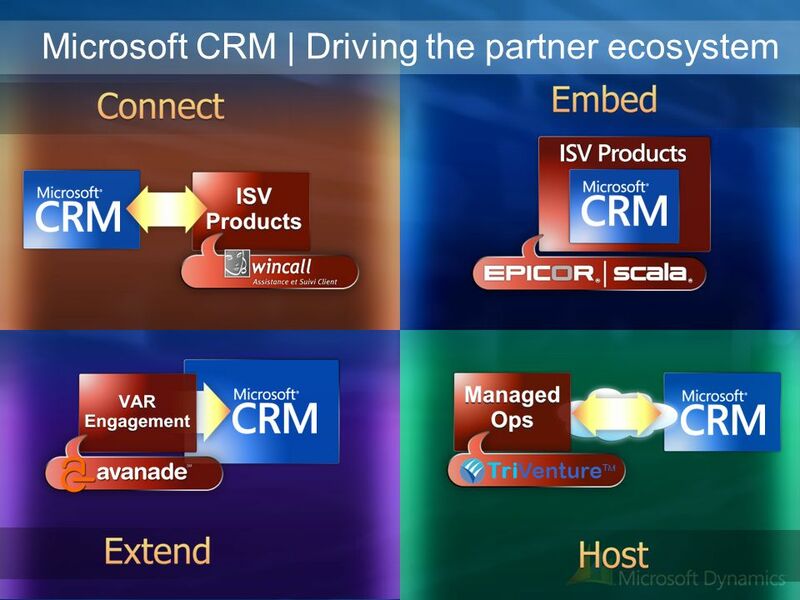 OnContact CRM Customer Relationship Management. 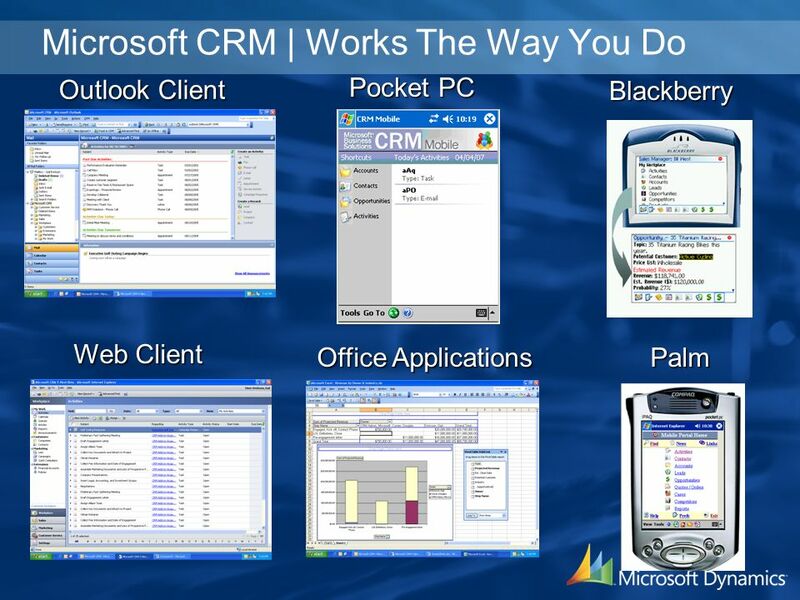 CRM 7 Benefits Rich "client" experience, completely web-based Access data anytime, anywhere. Ease of navigation. 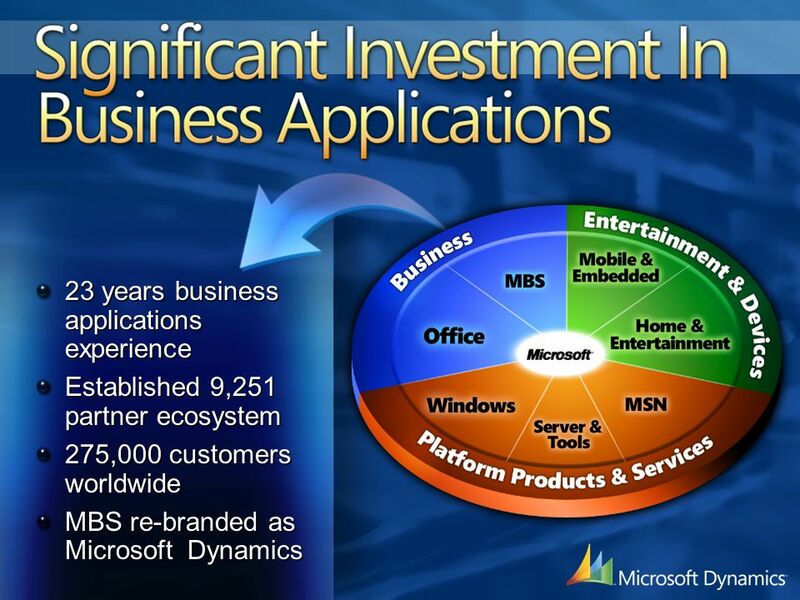 Microsoft Accounting Migration “Which Financial Solution Is Right For You? “Which Financial Solution Is Right For You? Power BI Sites and Mobile BI. What You Will Learn Sharing and Collaboration Introducing Power BI Exploring Power BI Features and Services Partner Opportunities. Vodacom Hosted Exchange. What is Hosted Exchange? A Business-Class Messaging solution and collaboration service designed to help your business communicate. Fòmasyon Itilizatè Ayiti Office 365 Fòmasyon. Why the Change? Partners in Health's new hosted Microsoft Office 365 solution allows users to access their. Introducing Microsoft CRM Rajinish Menon, MBS Partner Lead, Microsoft Jan Mohammed GM, Quality Solutions for Information Technology. CHANGE THINGS YOUR WAY May 30, 2006 Sales Force Automation Koen Pellegrims. Nick Mayhew Group Manager, Partner Strategy Stefan Jansen Hosting Manager Christian Longstaff Partner Marketing Manager.